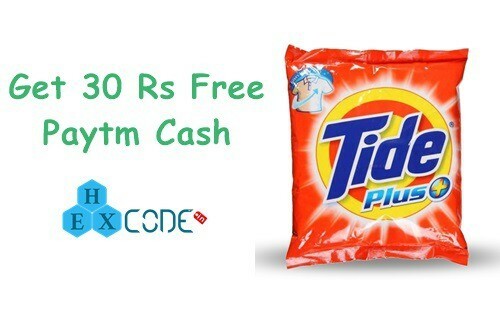 Paytm tide offer – Get 30 Rs Paytm cash coupon worth 30 Rs with every 1 Kg tide detergent pack. This paytm tide offer valid from 1st May 2017 to 15th September 2017. So buy Tide 1 kg pack and get free paytm cash. You can redeem paytm Tide code by visiting www.paytm.com/tideplus. Maximum 3 coupons can be added per account. UpdateNow you can get 15 Rs Paytm voucher on Tide pack of 500 gram and 30 Rs paytm voucher on tide plus pack of 1 Kg. We have got complaints from many users that paytm tide coupons are not working or not able to redeem. So, please don’t buy Tideplus just because of this offer. First of all, Visit your nearest store and buy new tide plus a pack of 1 kg. This tide Paytm offer is valid till 31st Aug 2017. Check out below FAQ’s for more information about this tide plus paytm offer. Also, checkout money earning offers which we added recently. Only select packs of Tide Plus 1kg and are running this offer. You can see the promo band on the front of packs announcing the offer. Packs without the offer may also be available in the market. For Tide Plus the promo code is printed on the inner surface of the pack. Please tear the pack from the crimp carefully to reveal the code inside. Do not damage the front panel. First of all, thank you for purchasing Parle Tide. Unfortunately, this consumer promotion has a limit of only three unique redemptions per mobile number which is mentioned on the pack as well. We suggest you redeem the fourth promo code on any of your family or friends mobile number. I have purchased a Parle Tide pack. It does not have a code. Why? The Tide Paytm promotion is applicable on select Parle Tide 1kg packs only on which the Paytm offer band is displayed. This promotion is not available on any other pack of Parle Tide. Hi i have got a tide plus pack. Paytm brand is also mentioned. But i m not finding any coupon code inside the pack. Hiii Please clear your Browser Data, Enable/Disable Airplane mode in your Mobile and try again. It should work. Also please let me know if it helps you or you need further help! Fake.fraud.chaep action.just to increase sale.fooling public.dont go for it.there is no code inside the pack. Hello anand, many people are getting issues while redeeming tide coupon. We have already written in post. Now please tweet to paytm on https://twitter.com/paytm and mention @hexcodein in your tweet, we will also help you to resolve this issue. Why it is telling that please try again..? Are they making us fool…! I did not get my cash on this site of tide plus. i redeemed code first time on my no. but it shows ‘please try again after some time’. in this pack paytm offer was mentioned with promotional code. Even I am getting the same error “Please try after some time” continuously from yesterday. Hi, It may be an old packet. Please buy new on which paytm offer is mentioned. Hi Dinesh, the link you have provided has worked like magic. Hello Anmol, Paytm tide offer is not working now!! There is no Option to enter the COUPON CODE. It’s coming as “Looks like you’re lost in SPACE” ☹️ on below link. Where to entry the code? Paytm has Removed option to enter tide code. So what’s the next option? How to use the code? I bought 9 TIDE packs yesterday. I have already written in post that don’t use this offer now. You can’t redeem paytm tide coupon. Sorry for your loss. Where use the coupn code? How many reedemed coupon on one no. ?